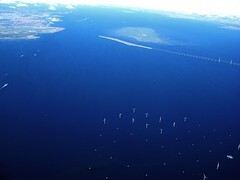 The world's first offshore wind farm, at the head of Copenhagen harbour. Denmark has long been a world-leader in wind energy and now the country will act as a laboratory for the development of infrastructure for electric cars, using wind power to charge the new vehicles. The main reason is that in five years Denmark will have wind turbine capacity enough for 1 million homes. 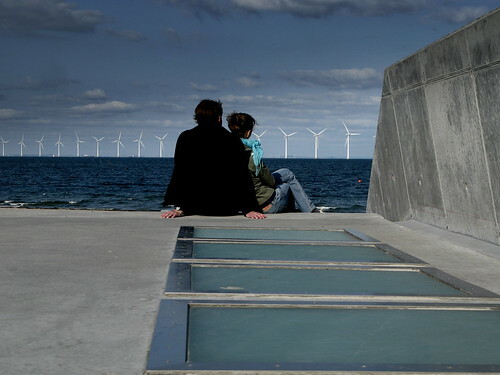 This goal will be reached when the world's largest offshore wind turbine farm opens in 2012, between Anholt and Djursland. The offshore farm will look like this new one off the coast of Copenhagen. The colossal amounts of energy generated will also be used to power cars, in order to exploit the wind energy as best possible. The energy generated at night, when usage is low, will be used to charge the cars for use the next day. The island of Bornholm will be the first test area and Peder Andersen of Energinet.dk believes there will be 100,000 electric cars in Denmark in five years. It will be considerably cheaper to own an electric car. Among the test cars is an electric version of the Renault Megane with a top speed of 160 km/h. It will cost about 2 kroner for 8-10 km of driving. That's a third of the price for petrol [gas]. The first cars will be presented at the Global Climate Conference in 2009. A number of energy players are involved in the project, including Danish Oil & Natural Gas, Ens.dk and energinet.dk. Not saying it's a good thing, more cars. Just reporting it.